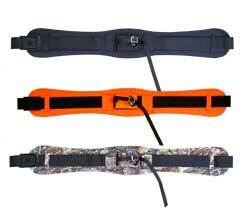 A Tool Belt for the hunter! Place your gear you need get to quickly on this belt. Available in Black, Camo & Hunter's Safety Orange. The Gunslinger Corral's famous Rifle/Shotgun Holster, the Quick Adjust Rifle Belt & the Universal Backpack Attachment. 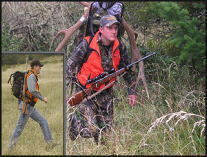 Holsters available in Black, Camouflage or Orange. *Left Handed models available in Black only. *Belt is 65 inch cut to size. *Standard Rifle holster fits any belt up to 2 inches wide.